Consistent access to clean water is something billions lack, and part of that is the inability to check whether one’s water is clean or not. 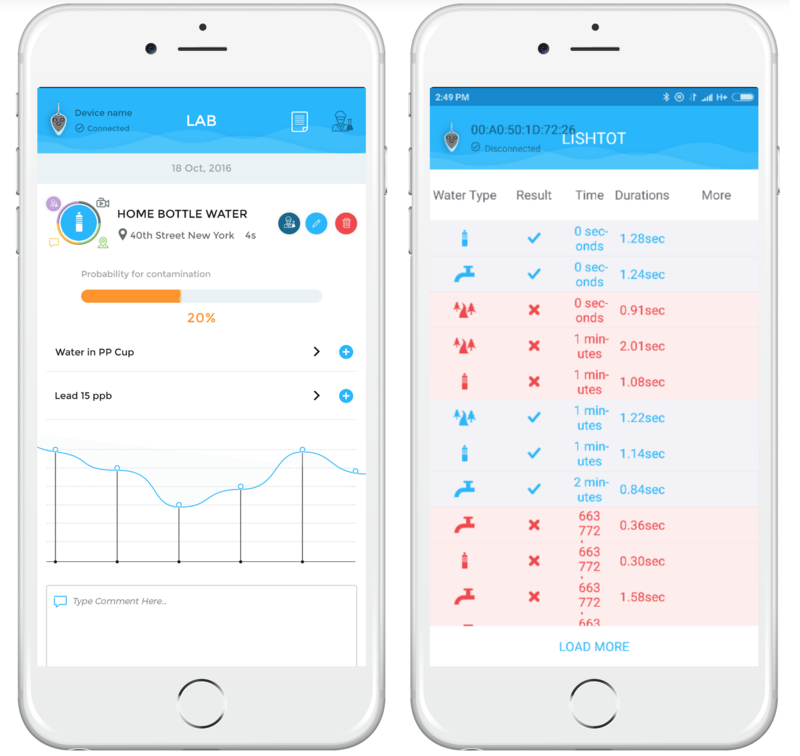 Lishtot could help change this with a tiny device that instantly determines if water is safe to drink just by analyzing the electric field around it — no strips, no microfluidics, no toxic chemicals. It honestly sounds too good to be true, but as far as I can tell it’s the real thing. I talked with Lishtot (Hebrew for “drink”) CEO Netanel Raisch at CES, where he demonstrated the simplicity and effectiveness of the TestDrop device. He had with him two plastic cups of water, to one of which had been added a contaminant. Pressing the test button, he moved the TestDrop toward one cup — blue light, clean. Do the same for the other — red light, contaminated. It’s that simple to operate; I did it myself successfully after one or two tries. It’s so simple, in fact, that I was suspicious. I thought it might be some kind of spectroscopy, but where was the emitter? Why did you have to move it, if not to create some kind of doppler effect? Turns out that the whole thing is based on the electromagnetic fields that surround everything. Water creates its own local field, which is measured by moving the TestDrop through it, and it turns out that clean water emits a slightly different field than water with lead or chlorine in it, water with E. coli, water with dissolved animal matter and so on. The device has been subjected to third-party testing, two reports from which I read; the thing really works. It detected even tiny amounts of lead and protein instantly and with 100 percent accuracy and no false positives or negatives. The replaceable watch battery should last for years even if you’re using the device 10 or 20 times a day. Several of these known readings are built-in (it’s calibrated around half a plastic cup of water, as the plastic doesn’t interfere with the fields) and the TestDrop doesn’t need to check its data against the cloud in order to give a drink/don’t drink response. If, however, you do want to bring in the smartphone and app part, there’s a service that Lishtot is running that tracks tests done with its devices, if users choose to submit them. Raisch hopes this will become a useful database both for ordinary users (who can find clean water sources if necessary) and governments or companies (who can tap in and watch for trends). You’ll be able to report problems directly to the utility, as well. Lishtot has more water purity-related technology on the way, but for now the TestDrop is its main product. The devices cost $50 each, or $35 with the CES discount — but my guess is they’re more likely to spread when bought in bulk by NGOs, utilities and other organizations, which will then distribute them where they’re most needed.